Yesterday it snowed here, which isn't really that unusual for the end of March. The minute it began snowing Cassie started singing, "Jingle Bells Jingle Bells", and that really put a smile on my face. I'm so thankful for my daughter's positive attitude, when most people are grumbling because of this Spring snow. Today we decided to continue being positive and play out in the snow and create this wonderful Easter Snow Bunny! Cassie helped to build the Snow Bunny and we brought out our leftover "snow paint" from when we last did Snow Painting in February. 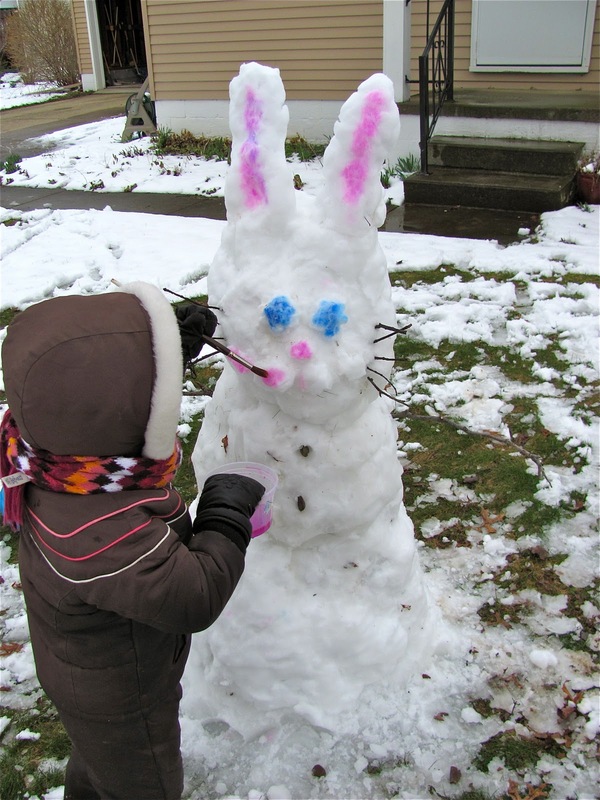 Cassie was so proud of this Snow Bunny! Using the "pouring" method to add color! I'm so happy to have this positive girl! I think we brought a lot of smiles to our neighborhood today! Hoping to bring a smile to you too! Did a child made you smile today? This just made me laugh and smile! 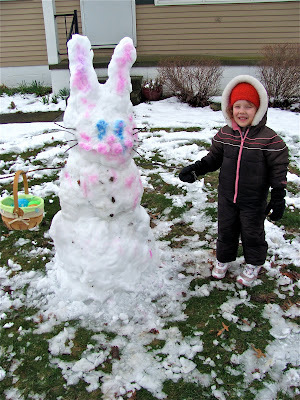 We had snow here too and was not too thrilled about it until I saw the Bunny and your C's smile! Lovely picture of Cassie and her snow bunny! Love the bunny! I live in MN and we still have so much snow. I think this sounds like a great idea for tomorrow! Very cute!! I know I have said this before but I am so envious of your beautiful snow! I don't think I would ever tire of it :) I just think of all the wonderful things we could do if we had snow. Love the bunny!!! Very cute! So cute! still have snow on the ground here so it's nice to see Easter and snow can be combined!! How totally cute. But SNOW???? Holy smokes! No snow for us so I'm a little envious! This is a really good idea!!! We have still snow too... Love it!!! I just showed this snow bunny to my children and we are all smiling! This certainly is an adorable rabbit. You left a comment on my blog which I thought had published, but it has not. I'm not sure what I did, but I am sorry that this happenened. Thank you for stopping by and I am delighted to have discovered your blog now. I am your newest follower. I love this! 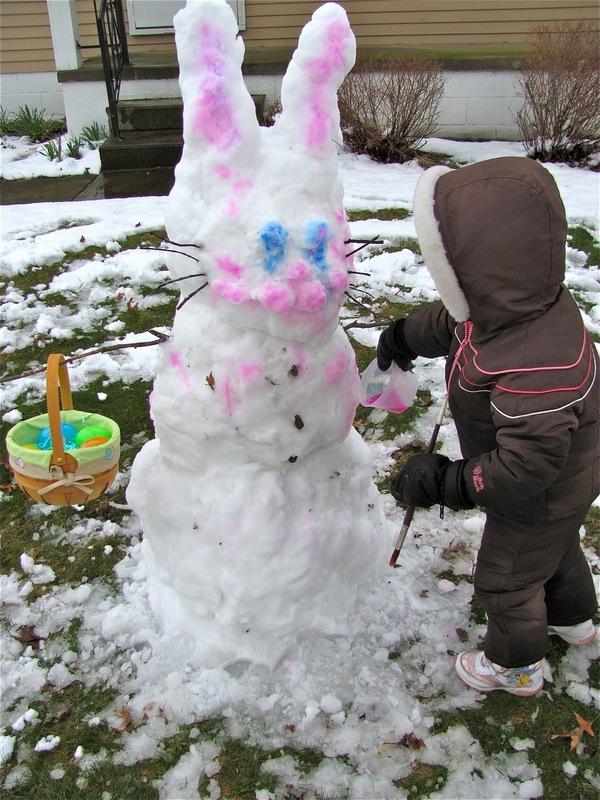 We have just enough snow to make a snow bunny here too. It's melting quick though. I can't wait for Spring! 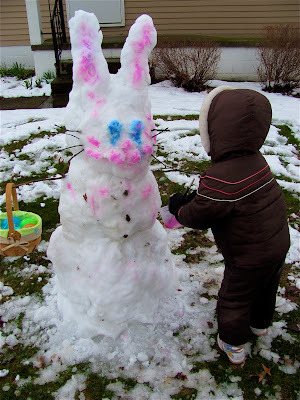 an easter bunny snowman!!! fantastic idea. love the pink. That is so cute!!! I love the color. And a bunny... too fun! This post has been featured in this week's High paw! Thanks for participation and hope to see you this week again with new great ideas! She is such an adorable kid also she is starting to be good at ice sculpture. Oh wow what a brilliant rabbit, love it!